Fukrey co-stars Richa Chadha and Ali Fazal represented Bollywood at the Oscars 2018 after-show party held on Sunday night (Monday morning in India) after the main Oscars event in California. Richa Chadha was Ali Fazal's plus one. 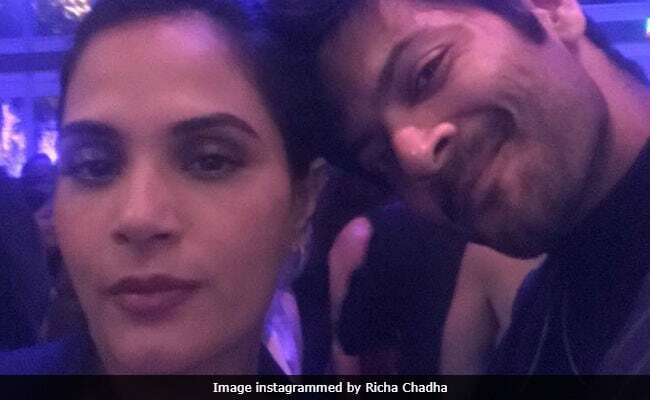 Richa Chadha posted a few pictures from the gala, one of which was a selfie with her 'main man' - Ali Fazal, of course. Last year, Richa and Ali made their relationship official. Richa also accompanied Ali to the various screenings of Victoria And Abdul worldwide. Victoria And Abdul, also starring Judi Dench, was nominated in Costume Design and Make-Up And Hairstyling categories. However, it lost both Oscars to Phantom Thread and Darkest Hour, respectively. However, Richa Chadha and Ali Fazal's Vanity Fair party experience wasn't as thrilling as the pre-Oscar party night. Remember, Leonardo DiCaprio photobombed their selfie? Richa was last seen in Fukrey 2 and her upcoming projects are Daas Dev, directed by Sudhir Mishra and Arjun Mukerjee's 3 Storeys, co-starring Renuka Shahane, Pulkit Samrat and Sharman Joshi. Ali Fazal is currently filming Happy Phirr Bhag Jayegi, which also stars Abhay Deol, Diana Penty and Sonakshi Sinha.